The public is invited Sunday, Feb. 26, 3-5 p.m. for a talk with Ben and his wife Melissa on everything from social justice, xenophia, book arts and more - it will be a dynamic talk. Ben will will discuss his art, Melissa and Ben will talk about on their work in social justice initiatives in Evanston. Ben is a founding board member of OPAL (Organization for Positive Action and Leadership). He is interested in equity issues in Evanston and how we as a community can affect change through political participation. Seats are limited, please register. 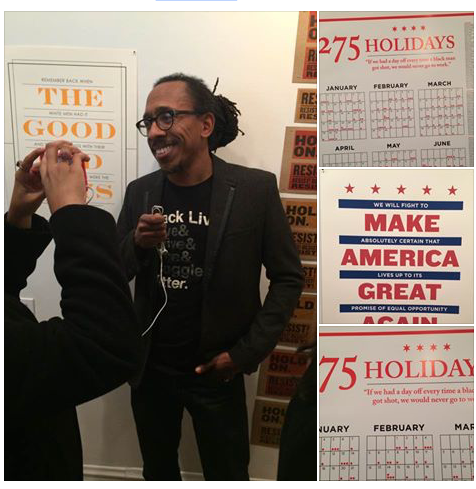 Ben Blount is a printer who uses books, posters and installations to explore notions of race and identity in America. Shaped by two decades of experience in design and advertising, his work draws on a common cultural language of objects, stories and experiences to draw attention to the differences between what we see, and how we are seen. With a range of contemporary influences from Dave Chappelle and Kara Walker to Mos Def and Amos Kennedy, Blount’s work is often provocative and topical. He has taught book arts courses at The Cleveland Institute of Art and Lillstreet Art Center in Chicago. A native Detroiter, he earned an MFA in Interdisciplinary Book and Paper Arts from Columbia College Chicago and currently lives in Evanston, IL. Gallery weekday hours by appointment only, evanstonmade@gmail.comGallery weekend hours, Saturday and Sunday 12 - 5 p.m.